Disclosure: Megan at Housewife On A Mission received the following items mentioned in this post at no cost to facilitate this review. All opinions are her own and were not influenced. Do you need more organization in your life? What about a cute new bag, purse or wallet? Thirty-One Gifts has so many great items from bags, totes, organizers, wallets and more that can be personalized and customized! They offer their products in really fun patterns and prints and colors as well! Janet Byers is a director for Thirty-One Gifts, and when she contacted me to work together I didn't hesitate to say yes. My husband and I recently changed the "theme" and decor of our master bathroom to to a Lacoste theme with the colors pink, green, white and gray and we absolutely love it. One thing we were missing was something to put our towels in. 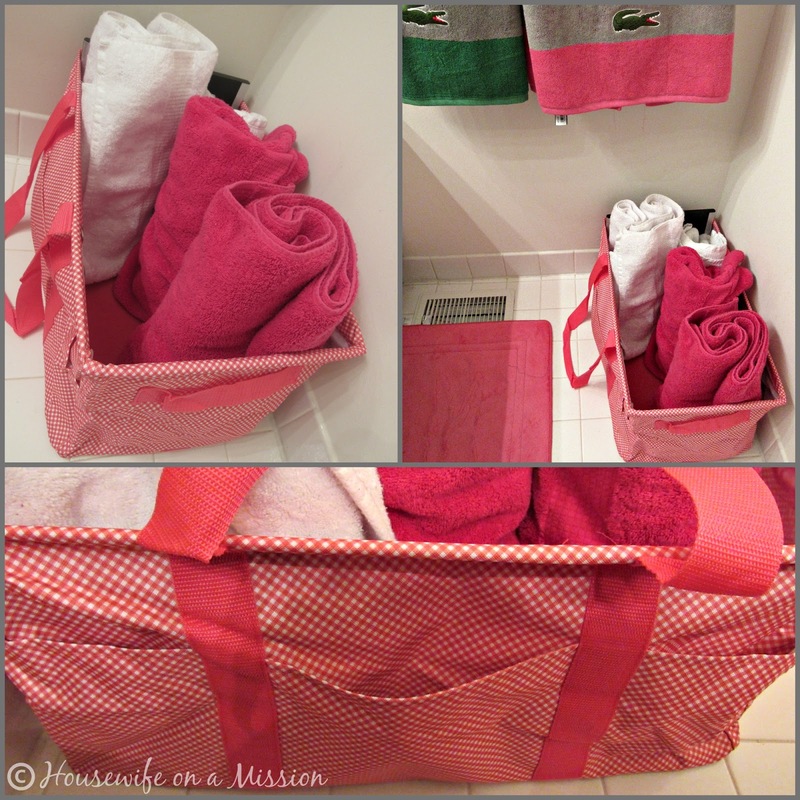 After shortly browsing Thirty-One Gifts' products, I saw a Deluxe Utlitly Tote and I knew would be perfect for organizing and holding our towels. I also saw a Sling-Back Bag that I thought would come really in hand for park days, trips to the mall and more. The Deluxe Utility Tote in Coral Mini Gingham has the perfect colors to match our master bathroom. I love how big and spacious it is, and that it comes with handles! This tote is going to also come in handy on days we go to the park. We can pack our lunches in here, outdoor toys, blankets and everything we would need to have fun at the park for the day! I also am going to take this with us to the beach when we go on our family vacation this Summer! It's perfect to sling over your shoulder take with you anywhere. The pictures below do not give justice on how big this tote is. Side by side, this tote can fit 3 grocery bags in it. It also has 3 outside pockets which is nice store car keys, sunglasses and even your cell phone and wallet. I feel that it is very study and made very well, so I'm even more exited for this tote! We also received the Sling-Back Bag in Grey Wave. I love the colors in Grey Wave- light grey, white and pink. This sling back pack is to go over one shoulder, and can be converted for right or left-handed use. It has two outside pockets that zip closed, and one netted outside pocket, perfect for a water bottle to be stored in. To open the bag to get to the main inside space, there is a vertical zipper in the front. I love how easy it is to wear, and is perfect for adults and kids to wear/use! It's really neat that you can personalize both of these items, and any item from Thirty-One Gifts! I absolutely love both the items we were sent and have my eye on quite a few other items that are on my wish list! Buy It: You can purchase a Deluxe Utility Tote for $50.00 and a Sling Back-Pack for $45.00 You can shop the catalog and see all of the great items there are, as well as current specials! 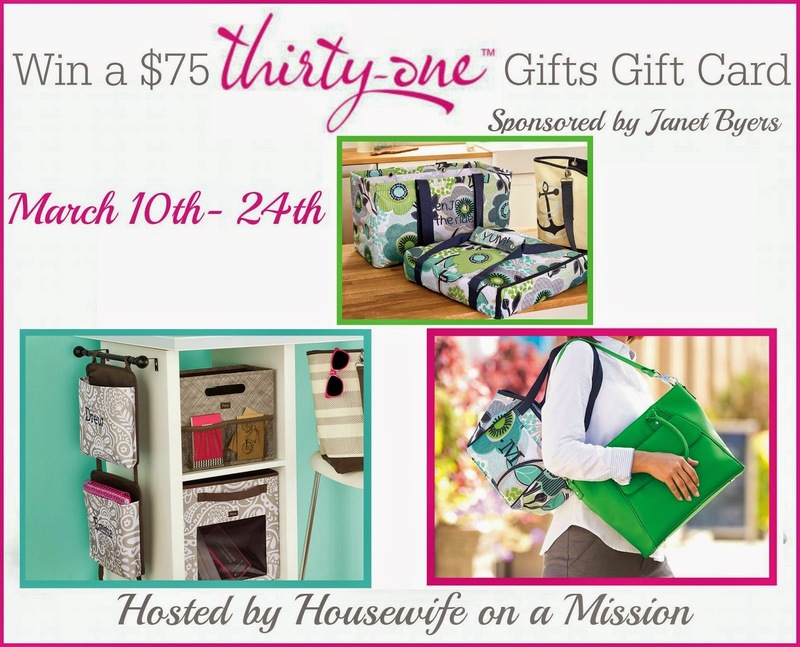 Win It: One of our readers are going to win a $75 Gift Certificate to Thirty-One Gifts, courtesy of Thirty-One Gifts director Janet Byers! When you're done entering, make sure to scroll down and enter more giveaways in the Luck of The Irish Giveaway Hop! I could totally use two of the large utility totes! Thanks! !